With nearly three decades of real estate experience and billions in sales under her (Hermès) belt, Dora Puig is the go-to broker for big-ticket properties on Miami Beach. In Miami, power brokers are a dime a dozen, partly thanks to the fact that for over a decade, this city has experienced a real estate growth spurt like no other. But even in a market where everyone and their mother seem to have a license to sell, there’s an elite group of luxury brokers, and Dora Puig is one of their reigning queens. With over 29 years in the business, Puig has sold nearly $2.7 billion throughout her career and in last year was ranked by the Wall Street Journal REAL Trends report No. 1 in Miami, No. 3 in Florida and No. 19 in the country. Along with heading up sales and marketing for Fisher Island’s uber-elite Palazzo Del Sol and Palazzo Della Luna, she also owns Luxe Living Realty, a residential brokerage for the luxury set. Dora Puig recently listed Villa del Mare Penthouse 7292 (aka the penthouse formerly owned by Oprah Winfrey) on Fisher Island for $32 million. 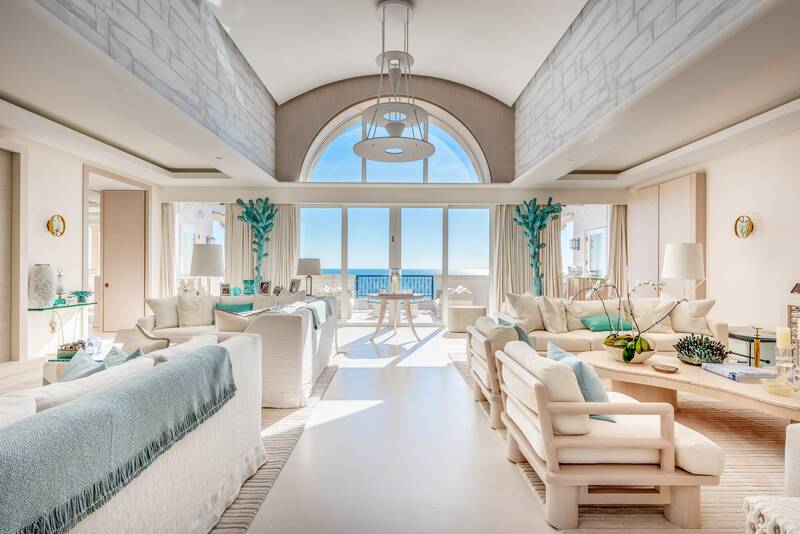 The four-bedroom stunner has 20-foot arched ceilings and unobstructed Atlantic Ocean views from every room. The interiors were done by Chahan Minassian. She has listed for and sold to Miami’s (and the country’s) most exclusive clientele—including Pharrell Williams—and happens to hold the sales record for a single unit on Fisher Island: the $35 million Penthouse 2 at Palazzo Del Sol. She also sold a residence at 41 Arvida Parkway in Coral Gables for $25 million—the most expensive single-family home ever sold in Miami at the time. Hard to top, right? Not for this fierce house hunter. We spoke to Puig in February, just after she listed her latest home—a nearly-$40 million stunner on Star Island. The listing says it’s “prestigious Palm Beach elegance meets the hip South Beach lifestyle,” and we have to agree. Although with a 10-bed, 10-bath gated Venetian villa with almost 1.5 acres to play on, you can have any lifestyle you damn well please. Located on the very tip of Star Island, this stunning edifice was built by Carl Fisher in 1924 on a pie-shaped lot allowing for to-die-for open bay views and an ideal spot to park your ginormous yacht. When asked what kind of person buys such a home, Puig simply responded, “A billionaire.” Clearly. In 2017, the property was gut renovated, restoring select architectural details in more formal entertaining rooms while casual spaces got a fresh-meets-relaxed vibe and the kitchen was outfitted with an ultramodern look and feel. Of course, no property at this level is complete without lush, perfectly maintained gardens and a pool area designed for R&R or MP (major playtime). Life at the “tip” has never looked better.